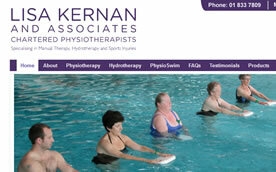 Lisa Kernan is a chartered physiotherapist with a head office in Clontarf, Dublin 3. Lisa's services include Hydrotherpy and classes are conducted in Sportslink in Santry. Lisa also sells various products related to her practise and well-being. Aztec Design visit Lisa in both her office and during one of her Hydrotherapy classes in Dublin for a photoshoot. Many of the photographs taken are visible on Lisa's website. 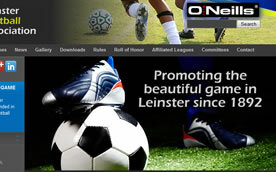 The Leinster Football Assocication are the governing body for football in Leinster, from Wexford to Offaly. The association were actually the main soccer association in Ireland, even before the FAI and represent the largest orginisation after outside of the main FAI body. Aztec Design retouched the associations logo, redesigned their website and built it using a contest management system which makes it easy for the associations administrators to update their website without any web design experience. We look forward to working with the LFA in future. Ray of Light Wellness Center is the place to go in Gorey for Acupuncture and Chinese Medicine therapy. Mia Fleming, the owner has a wealth of experience and qualifications to assist in a range of alternative treatments from mental distress to muscle pain. Mia wanted a website to suit her business branding so we with a strong 2 tone colour contrast website which featured a selection of Mia's testimonials from past clients. Mia also had a large number of business cards printed along with her website. Stage Academy Newbridge (formerly known as Stageworks) is a dance, drama and music school with courses and classes from beginners to seniors. Classes are fun, fast paced and its a great way to meet others and keep fit. Paula and Brenda come from a background in performance schooling and perform regular classes in and around the Newbridge area.. The Carlow and District Football League is the governing body for soccer in the Carlow region and beyond. Affiliated with the Leinster Football Association and the FAI (Football Association of Ireland) the league administrates football throughout the county. 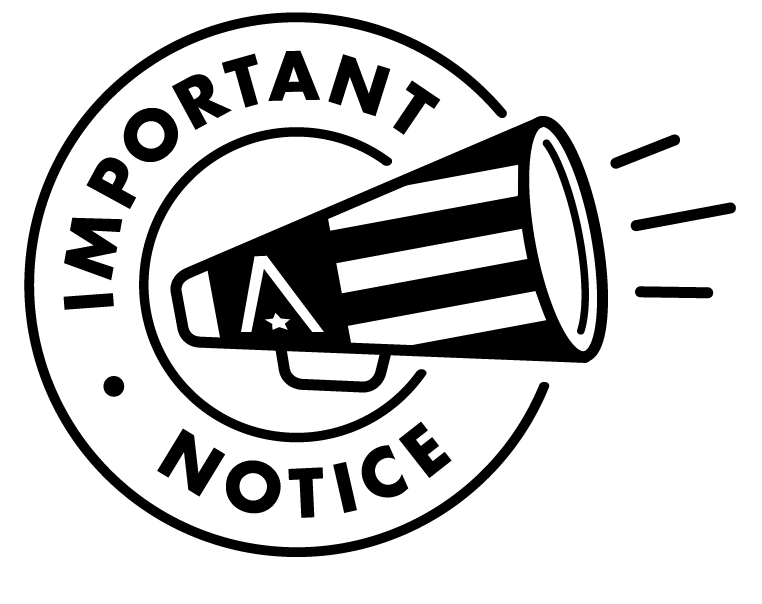 At Aztec Design we drafted up a proposed new website which was more modern, more easy to update for the league administrators and which incorporated a nice image slideshow and social media sharing to encourage the promoting of the league by its viewers and followers. Annasyme offer personal fitness training and nutritional information on the outskirts of Gorey town in their custom built studio. The classes are mainly offered for women and are aimed to get the most out of your fitness workouts with a combination of custom planned training exercises. Anna, the business owner came to Aztec Design with idea's in mind for her logo and website. Aztec design then worked with Anna to devise her preferred logo and then came up with business card and flyer designs. 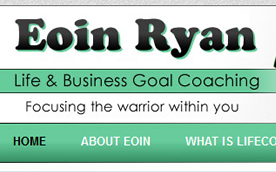 The business website use's colours to compliment Anna's choice in her logo and stationary. 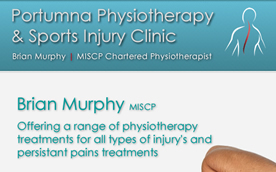 Brian Murphy is a member of the Irish Society of Chartered Physiotherapists and has an established custom built practice in Portumna, County Galway. In addition to the provision of Chartered Physiotherapy, the cliinic also provide deep tissue masseuse services, specialising in sports massage. Aztec Design drafted up sample websites for Brian and worked with the clinic to generate the content. We also provided Brian with a new logo and company letterhead. Brian's new website also features shocial media integration in the form of a sharing menu to the left, allowing visitors to share the website on their facebook and twitter accounts. Blackwater Stables provide trekking, breeding, breaking and boarding of horses and ponys in one of Ireland's most scenic area's, the Ring of Kerry. 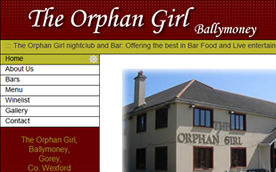 Based at a prime near Killarney the farmyward and stables also do pony camp's, family days out and birthday parties. 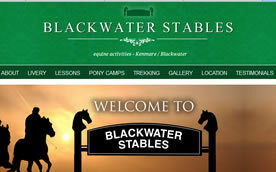 The re-design of the Blackwater Stables website was done with minimal fuss and hassle from the owners part as Aztec Design put together a working sample with looks professional and effective. 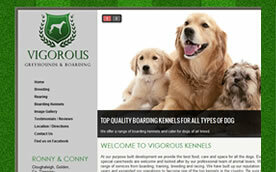 Vigour Kennels are a professional greyhound breeding and dog boarding establishment in Tipperary. Their well established and renowned business caters for a greyhound training, sales, breeding and general dog boarding and throughout the years Vigourous have proudly produced some well known greyhound racing champions. 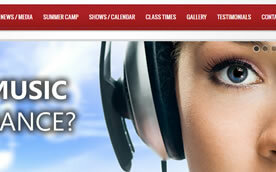 Aztec Design provided Vigous with a brand new clean and modern website with a nice home slideshow. The work was done in a matter of days and all done over a quick phonecall with the owners. 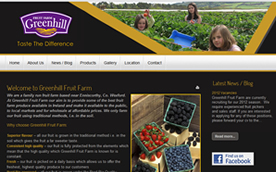 Greenhill Fruit Farm are a family run and operated fruit farm based near Enniscorthy in county Wexford. They offer a range of fresh fruit produce from strawberries to gooseberries. 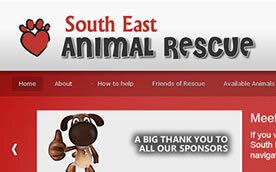 Aztec Design done a redesign of their existing website, with a focus on good professional images and a nice crisp look. There is a small image sliding gallery to highlight the fruit produced at Greenhill Fruit Farm. We also setup a Facebook page for the Farm. Allure Salon is an upmarket stylist hairdressers based in Tullamore, Co. Offaly. Since establishment the salon has expanded and now even offers full time college courses in the adjoining school of hairdressing. Aztec design were provided with the text and colours of the salon and came up with a nice elegant website that showcases all the salon has to offer. The website has a photo gallery, a pricelist, a nice graphic showcase and a contact form as well as special offers scrolling on the sidebar to grab attention. Allure School of hairdressing is a renowned college of hairdressing and makeup based in the midlands. The school offer a wide range of courses from 1 day refreshers to full time 15 month diploma's in hairdressing. Aztec Design came up with a couple of samples for Allure to choose from at no charge after a simple email from the school of hair. Once a design was chosen the website was delivered withing 2 weeks with a custom built template and a step by step user instruction manual in order to Allure to easily add content and images. 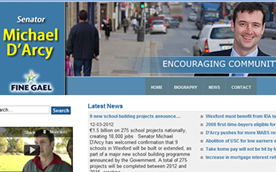 Senator Michael D'Arcy is a former Wexford TD and son of former Fine Gael Minister Michael D’Arcy Snr. Michael works as a full-time public representative and local farmer. He is currently the Fine Gael Seanad spokesperson for Finance. Aztec Design designed Michael's website in a modern style incorporating a blog style news page, YouTube video, a twitter window and a link to Michael's Facebook. As you can see from the site there is also a nice slideslow of images, search functionality and a tag list. Embrace Bridal is a bridal shop located in Esmonde Street, Gorey offering a range of wedding dress's, bridesmaids dress's, wedding accessories and wedding jewellery. There are a range of collections from various designers available and the wedding dress's come in a wide range of sizes. 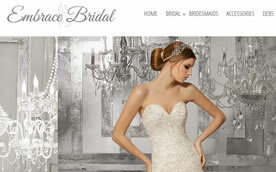 We designed the Embrace Bridal website based on the shop signage already in place and incorporated an image slideshow into the website. 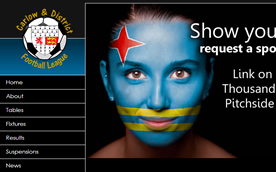 The Saints FC website was done from start to finish in less than 1 week and an instruction manual was sent to the club administrator who is very keen on working with the website. 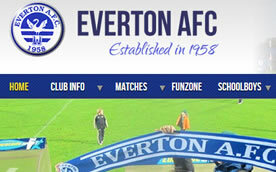 Already they have managed to update the content, add photograph's, match reports and news articles. Best of luck to the club and wishing them the best as they move onwards and upwards!! 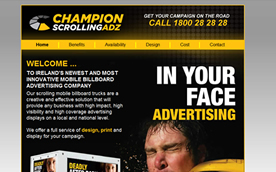 Champion Adz are Irelands newest and most innovative advertising/marketing company and they required a website that used animations to show visitors just how their scrolling advertising machines work. 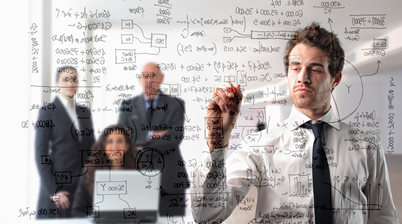 We came up with the website proposal and then got to work constructing the site and putting everything together. 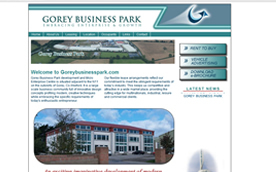 We have developed a website for the Gorey School of Hairdressing and helped out with the company branding. The School of Hairdressing is a great addition to north Wexford as it provides a place of study in Gorey for those considering hairdressing as a career. As you can see by looking at the website there is a Facebook news feed page which means any posts they make on their Facebook wall automatically get updated. SalonXcel is a hair salon based in Gorey Business Park. The SalonXcel is affialiated with Gorey school of Hairdressing and is the latest venture of Byrnes Hair & Beauty Supplies. The salon offer weekly specials and also have deals for customers when the students from the school of hairdressing are plying their trade.